A group of us here in Europe would like to ask you a few questions regarding the Great Invocations. During our last study group session (last Monday), we considered the Dutch translation of these Great Invocations, and the eventual use (in our study group only) of the Dutch version. Considering the Dutch translation, we came more in touch with the profound meaning of these Invocations. One of us noticed the mantric force in the Invocations, which should also be there in the Dutch translation. And for some it was not clear what is really meant by “all pervading Spirit-Life”. Also, earlier, we heard a long time devotee say that these Invocations where created by devotees themselves, but she was not really sure about it. So, last Monday, it was suggested we should ask you, as you have been very close to Beloved Bhagavan for many years, and can probably give us clear answers. 1. How came the Great Invocations into being? What had been the impulse? And who formulated them? sorry for this extended answer but I got into it a bit. Of course Adi Da and only Adi Da wrote the First Great Invocation and the Second Great Invocation. (There are other parts of the of the daily puja cycle that Bhagavan Adi Da did not Himself write–such as the Arati song, or the paduka chant, etc. But this is not the case with these Invocations.) The First Great Invocation was given to us on March 23, 1978. Adi Da was at the Mountain of Attention when this was given to us. He was still Bubba Free John, not yet even known as “Da”. So when it was first given to us, the first Great Invocation began, “Radiant God” rather than “Radiant Da”. We henceforth began our meditation session or any group gathering, such as a devotional group, with this Invocation. Prior to 1978 we did not have a cycle of daily devotions. Of course we meditated and offered a gift and bowed, and received Prasad afterwards. That was the Sacrament of Universal Sacrifice, giving and receiving of gifts, although I don’t think we used that term. I think it was just the giving and receiving of Prasad. There was no other formality that we had. 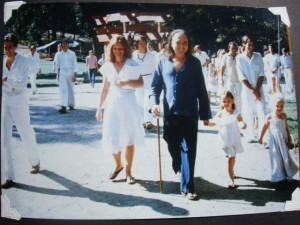 And so during that year, Bhagavan Adi Da, one by one, gave us what became known as “the full cycle of devotions”. It was the development of our fuller devotional life, giving us much needed form and means by which to invoke and commune with Bhagavan Adi Da. He taught us very concretely how we should live our devotional life. Getting up in the morning and immediately meditating without distraction. And after meditation, studying Bhagavan’s Word, in silence, without outside stimulation. And how to spend our time in the meditation or communion hall. 1978 was mostly about the things that we do individually and in the hall in our recitations and also the group devotions while sitting together in the hall. “We do not know what any thing is. We do not know what the body is. We do not know what a thought is. Therefore, let us pray in Divine Ignorance. We were given the practice of the Prayer of Remembrance on May 20, of 1978. Bhagavan Adi Da had been at the Mountain of Attention when He began Giving us and Working with us on this full cycle of devotions. But He moved to Hawaii, to the residence known as Muliwai. Here Adi Da lived a very formal life, and there he was celibate personally, and the whole circumstance was pure and clear. Adi Da always remembered this as a good time and much was developed during this time both in terms of developing the practice within His own Personal Circumstance and household and within the larger Community of devotees. It was from here that He sent back the Instructions about the Prayer of Remembrance. When we were told to get a mala and to engage the Prayer of Remembrance, it was quite a shock for all of us. You may remember that Bhagavan Adi Da and said in the original version of the book The Method of the Siddhas, that He would rather “beat us with a stick than give us a mantra”. He had always criticized rote practice of devotion, and doing devotion as a form of Spiritually “showing off”. But now He gave us a practice of remembering Him through invocation using the mantra. We did not yet have the name Da when we were initially given this practice. And so with each bead, as we pulled the mala, we invoked the Spiritual Presence that we knew as our Master with the name “God”. It was not until the next year, on September 13th, that Bhagavan Adi Da wrote what we came to call the “Beloved I Am Da” letter. And then He announced that to all of us in the landmark Day of the Heart talk on September 16, sitting in what has now become the Paduka Mandir at the Mountain of Attention. So that everyone could have a mala, I went out and bought over 200 tulsi bead malas. And the announcement and full presentation of the Prayer of Remembrance was made at Talking God Seminary, in Clearlake, which we were using for our Sunday Da Guruvara days. Of course not called Da Guruvara at that point. I found that in India that Thursday was called Guruvara, and was the day that was Sacred to the Guru. And so in 1989 I suggested to Bhagavan Adi Da that we should call the Sunday retreat day the Guruvara. 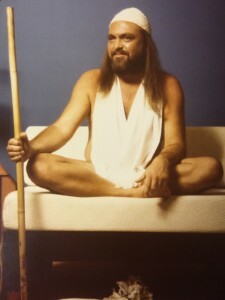 He accepted this and later it was made more specific to Bhagavan Adi Da by calling it the Da Guruvara day. 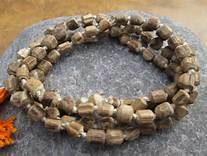 So getting back to the Prayer of Remembrance, everyone bought a tulsi bead mala for just $2 so that we could begin the process of the Prayer of Remembrance immediately. And later Bhagavan recommended using rudraksha or sandalwood malas. 8. And then, in the full cycle of devotions, we would receive Divine Gifts, or Blessed Prasad. I am not sure when we were given the Second Great invocation. I need to do some research on this. “Know this: I appear among My devotees to receive and accept their Sacrifices, their Worship and Remembrance, their Surrender, their Requests, their Love, their explicit Devotion of body and mind. When I visit the community of My devotees, they should spend that time in every kind of devotional association with Me, in order that I may Respond to them from My Heart, Granting them the Blessings of all My Blissful Excesses. 1979 was the development of the more active Sacramental activities. We learned what a picture of Adi Da as a “Murti” meant, and how to treat them, and how to engage the “theater of Divine Association” with Bhagavan Adi Da through puja or Sacramental Services. 2. What is exactly meant by “Spirit-Life”? We would be very grateful for your clarification. When Adi Da gave us these practices, they were very basic, very primal. Long before the language in Adidam had become more formalized. And so Spirit-Life is an early description of what might later be called Conscious Light, or Radiant Transcendental Being, or the Divine Presence, or any of the names one might give for the basic and primal feeling of Divine Reality Itself, which we feel in Adi Da’s Company when we Recognize Him. Spirit-Life is descriptive of the Presence of the Divine or Bhagavan Adi Da or the Spirit in Life itself, which is not abstract or elsewhere or floating in the vapor. The All-Pervading is showing us that Bhagavan Adi Da, if we will recognize Him, is everywhere! There is no limit to the Spirit-Life, but it embraces and includes All and all (as Adi Da has put it).